Madhav and Shanta meet villagers and request them to help Appa Patil monetarily with whatever money they can. All villagers agree. They return to Dwarkamayi and hope villagers come foward soon. Sai says they will come as Shanta is working hard. Shanta brooms floor. Jhipri comes to help Sai. 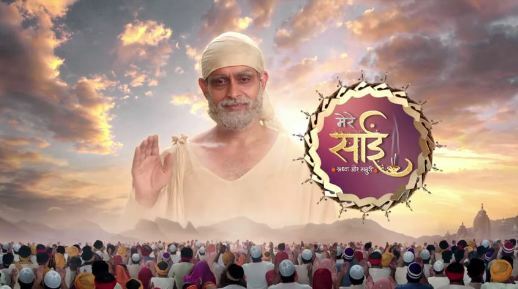 Sai says she should help Shanta as Shanta is working hard in repentance. Jhipri takes broom from Shanta. Parashuram’s wound condition worsens and he goes to Kulkarni for medicine. Kulkarni says his wound will take to heal as it is infested by black magic, but he has a special costly Himalayan medicine which will cool his pain. Parashuram says he is not worried about expenses and just need relief. Kulkarni gets medicine thinking he is selling 2 Rs medicine for 50 Rs. Madhav with Shanta eagerly waits for people to come forward and help. He tells Sai it is already afternoon and nobody came yet. Sai suggests to be patient. People start coming and put money in pot. Madhav and Shanta get happy seeing that. Ladies say they all gave their petty savings and not from household expenses. Bheema asks till when they can help as few of us will get wages in the evening. Sai says he will keep pot till night, anyone can come and add money till then, helping each other is good deed and they all will blessed for helping Appa, today is poornima/full mon night and they all will be blessed. Anta and Panta rush to Kulkarni and inform him villagers are helping Appa with money. Kulkarni laughs and says they themselves are poor and cannot help themselves, how will they help Appa. Keshav comes out and says that is specialty of Shirdi people, they solve any problem on them united and Kulkarni knows they solved many problem on them with unity. Kulkarni angrily asks him to go and study and sends him in. He stands fuming. Sumitra gets happy seeing people helping Appa and says she got 3 rs by selling her mangalsutra and had kept it for Jhipri’s jewelry, she put it in pot and felt very happy. She praises Sai and Madhav for their help. Sai says she is ignoring Shanta’s hard word, forgiving is a very kind act. Sumitra does not react. Rukmini asks Keshav to have dinner as she prepared food late today. Kulkarni taunts that Keshav has become self-egoistic and thinks I earned money via sin, so he will not take anything earned by me. Rukmini asks Keshav what happened now. Precap: Bheema tells Sai that only 250 Rs are collected. Sai asks to check pot again as some money may be left inside. Bheema sees stones turning into money.